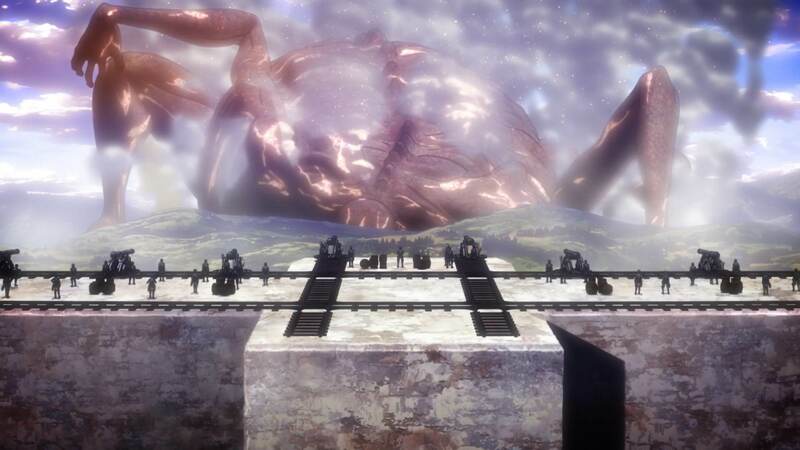 Attack on Titan‘s third season hit a major climactic moment so let’s recap how the production has fared so far, good and bad, before we explore how the team gave extra oomph to this big moment. Quite the directorial superstar arrived to assist studio WIT’s efforts! 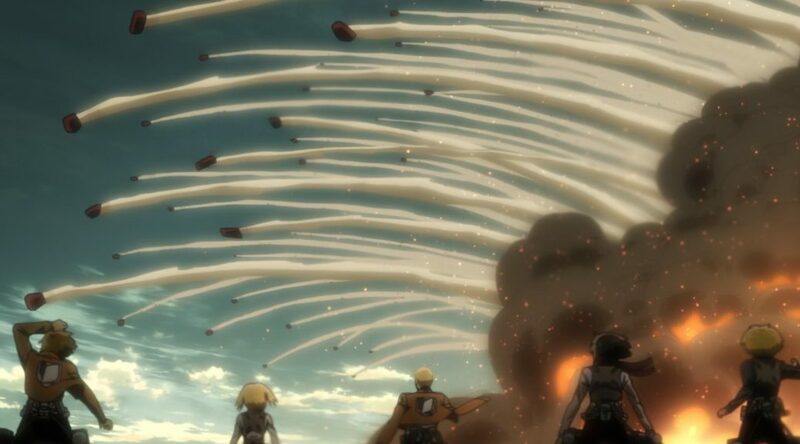 ─ A couple months have passed since our previous post on Attack on Titan, so we’re due a bit of a production recap. Calling this third season uneven seems like a fair assessment. 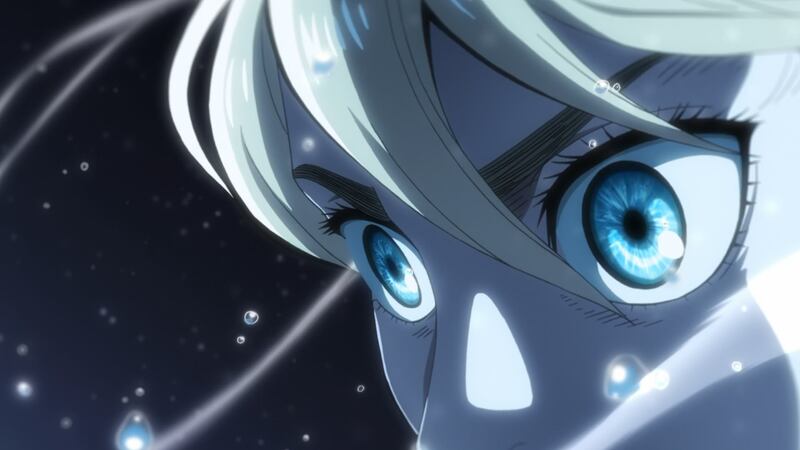 This starts with the material they’re dealing with in the first place: slowing down has allowed a wonderful character arc like Historia’s to come to fruition, but most viewers would agree that the conflict within humanity factions just isn’t as compelling as the frenetic fights versus naked giants, and that this series has always been better at intrigue than at giving fulfilling answers. There are plenty of fans who think of this part of the series as lesser and thus assume it’s been handed to small-time staff, but that couldn’t be any further from the truth – if anything, this third season is attracting more directorial talent than ever; alongside household names currently affiliated to studio WIT like the meticulous Ryotaro Makihara and ex-ufotable leader Takayuki Hirao, we’ve seen multiple guest stars that can be traced back to series director Tetsuro Araki‘s early days at Madhouse. Such is the case for Yoshiaki Kawajiri of Ninja Scroll fame, and Mamoru Hosoda’s bright disciple Tomohiko Ito, perhaps best known for a certain series about blades on the wired. ─ As previously mentioned though, season 3 is kind of a bumpy road, so the impact of all that talent has been lessened due to an unfortunate combination of questionable decisions and poor timing. Attack on Titan has never been that daring of an adaptation, perhaps because it didn’t need to be one in the first place. Araki’s bombastic sensibilities and a team that made the action thrilling in ways that fit the medium were enough to make the anime stand on its own, so there was no need to get particularly inventive with the character scenes. The problem comes with a third series that mostly focuses on those, and rather than take it as a chance to elevate the material, the team hid behind the manga panels for a much more slavish adaptation. Isayama isn’t particularly good at conveying information visually to boot, so unfortunately we’ve had super talented individuals putting together very modest work. Far from terrible, but also nowhere as exciting as the line-up of people involved would lead you to expect. ─ Whenever there’s no action going on, that approach also led to almost unheard of low numbers of shots for this day and age – which makes the departure of the make-up team, capable of making still drawings come across in striking fashion, even more of a shame. The two chief animation directors Kyoji Asano and Satoshi Kadowaki, busier than ever after they lost Ayumi Yamada to Banana Fish, have gone on overdrive and are correcting an outrageous quantity of drawings to make those still shots feel as impressive as possible, but there’s only so much they can do. When things do get hectic, the number of cuts can go as far as doubling, causing other problems to arise. This became most obvious a couple of weeks ago, with an action spectacle filled with animation superstars… which felt weirdly clunky at points, featuring a bunch of genuinely unfinished sequences. WIT being too busy for their own good is sadly not news, and yet the effect that has on this season is more noticeable than it’d been for quite a while. This situation isn’t as messy as during the first season of course, but it’s undeniable that this season doesn’t have the resources they need. ─ That summary might have sounded a bit too harsh, but it seems important to establish this season’s lacking aspects to get across why this episode was so satisfying. It doesn’t depart from the source material all that much after all, instead relying on the execution of Isayama’s ideas to make this into a worthwhile experience. And that came down to Shinji Higuchi, who storyboarded most of the episode. To get across how big of a deal his presence is, let me echo a funny anecdote: when the key staff were meeting in a pub to request Higuchi to handle this episode, they got recognized by an attendant there, whose astonished face has since then been burned into Asano’s memory. But fame aside, it’s quite obvious that this is the kind of material that Higuchi feels comfortable with; he has a notorious passion for military structures and aesthetics, but he also tends to find himself questioning their inner workings and the way they deal with threats to society. And as you likely know, kaiju works happen to be his forte, so of course he’d handle the episode where humanity faces the biggest titan in the entire series. Now all of this doesn’t guarantee him success, as seen on his… unfortunate live-action adaptations of Attack on Titan, but in theory he’s predisposed to excel in situations like this. ─ And in practice, this time Higuchi did succeed. The episode isn’t outrageously adventurous – though it sure was taxing for the team – so much as it’s smart in its execution. Most downtime scenes still stick very close to the manga panels, but anytime something that tickles Higuchi’s fancy comes into play, things become all the more exciting. The unsettling scene before the opening with the titan POV serves as a good prelude of things to come, proving how much of a threat Rod Reiss’ mere existence is. Under Higuchi’s control there’s a heavier and more effective focus on scale, and his expertise in the genre also helps when it comes to showcasing military might. The effects animation play a big role in this regard, which isn’t much of a surprise considering the presence of experts in the field like Kazuto Arai and Satoshi Sakai who don’t need particularly unique detonations to leave a strong impression – though it’s precisely a non-standard explosion that leads to the highlight scene later on! ─ Before we move onto those spectacular pieces of animation though, there’s one final aspect where Higuchi’s presence was key: horror elements. Rod Reiss already felt like a massive threat, but the team made extra steps to also make it feel as grotesque as he should be. Additions like the constantly dripping blood and especially the sequence where his guts spill and almost crush some people are already among the most horrifying in the entire franchise. 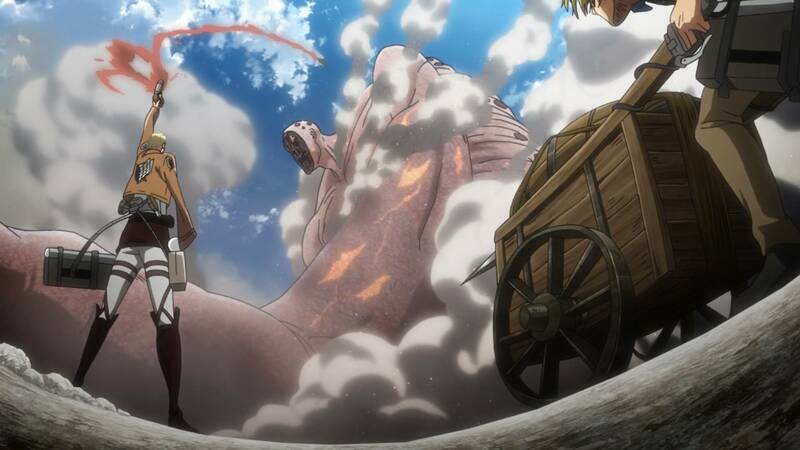 A reminder that the existence of this titan who injures itself just by existing and is too large to comprehend simply isn’t meant to be, even in the crazy world of Attack on Titan. In this regard, Higuchi found his perfect ally on episode director Yasuhiro Akamatsu (technically also co-storyboarder, but his contribution there appears to be so minor even his coworkers forgot to thank him for it). Akamatsu used to be attached to studio Gainax doing composite work, but he keeps popping up in this site because of his frequent collaborations with WIT nowadays. The common thread among them all is how he uses his previous skillset to give extra oomph to the presentation of all elements, which in this case allowed the team to make Rod Reiss even creepier. Thank him for your nightmares too! ─ Now you know exactly who was in charge to bring to life that abomination, so let’s move onto those who got rid of it in grand fashion. To the surprise of no one, Attack on Titan‘s climactic action setpieces are once again synonymous with Arifumi Imai. At this point we can spare you his introduction, because even if you’ve never read up anything on the production of this series, if you’ve made it this far you’re at least instinctively aware of his presence as the individual who’s defined this franchise’s distinct action scenes. Imai has gone above and beyond the role of an ace animator; although uncredited, he once again storyboarded the action in this episode, and it’s precisely animators whom he personally requested that handled the key bits he couldn’t animate. Things kick off by the hand of Mitsuaki Takabe, a fastidious yet quick animator who’s earned his trust despite not being quite as glamorous as some of his peers. And after an incredible explosion drawn by Imai himself, the focus switches to his other guest: digital animation superstar Takahito Sakazume, who did what he does best while offering a different flavor of free-flowing camera than the series is used to. ─ This episode features a list of notable animators that never seems to come to an end. Smear master Toshiyuki Sato. Tamotsu Ogawa, one of anime’s most captivating surreal animators. Shunsuke Okubo, who embodies the hope for Toei’s future. Ex-KyoAniDo member Keita Nagahara, always reliable no matter what he’s entrusted with. French animator Achille Bibard, making a reappearance at WIT. Kana Ito, coming right off the legendary Boruto #65. WIT’s own Atsuko Nozaki, perhaps one of the best theatrical talents in the making. Even Naoyuki Asano, who appeared by Akamatsu’s request. And yet, despite this accumulation of talent, it’s Imai who stands out the most again. Rod Reiss blowing up was quite the unique explosion, bringing to mind his jaw-dropping FX work on Rolling Girls, but his final scene with Historia might be Imai’s greatest contribution this time around; his work always feels impossibly detail-oriented for something that frantic and seemingly chaotic, somehow marrying that expansive three-dimensional movement with neat minutia like the attention to the angle with which water slids off her face due to the speed. The circumstances surrounding this season might not be ideal, but moments like this remind you why Attack on Titan was an inescapable title at its peak. I really like what Higuchi did with the first AOT live action movie (not so much the second but that’s another matter). He really added an element of horror that wasn’t prevalent in the first two seasons of AOT. He brought that same feeling of dread to this episode and I really think that’s what made it stand out, along with pairing him with the right source material to cover. Stuff like this makes me wish for a new Higuchi work where he could go all in with the horror elements. It’s not just that he understands how to make kaiju-style titles eerie, there’s just something unsettling about his work as a whole. Even HisoMaso, which is for the most part cute and colorful (since the edge it has is sharp but allegorical), still can be weirdly unsettling. He’s good at this! There were some really interesting points in this post. It was really nice to hear what is happening behind the scenes of the production team behind this series. I don’t know many of the staff working behind the scene but it is good to know who has been producing what part for the series, I wonder if any of the staff are also working on a another series while doing AOT. I am excited to learn more about the behind scenes. Thank you for the informative post!